A vertical conveyor is essentially a horizontal conveyor that has been turned on its side to position the conventional belt surface vertically. Perforation patterns and keyholes may be combined with custom nest attachments to hang or carry products through an automated process. Belt Technologies can engineer and manufacture stainless steel belts specific to customer applications, and well as assemble full custom vertical conveyor systems. Belt Technologies engineers can provide design support to ensure the success of your conveyor application with custom belts, perforation patterns, and attachment integration. Building a vertical conveyor requires effective problem-solving skills and an innovative approach to engineering a solution. 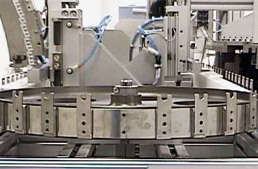 Belt tracking and indexing is a primary concern with vertical systems and special attention must be paid to the relationship between the belt and its pulleys to guarantee the belt will not slip during normal operation. Belt Technologies engineers have successfully developed methods to ensure belt alignment for vertical conveyor systems and are prepared to assist with this important design element for your application. Belt Technologies specializes in helping companies build and customize stainless steel conveyors. Our engineers have the knowledge and experience to effectively work with your design team to optimize your conveyor system and ensure you achieve the maximum lifespan and product throughput for your equipment. Contact Belt Technologies today to speak with one of our engineers about your specific system application. To learn more about vertical conveyor systems, contact us today.